In the early 1900s the club was known as Duniry Hurling Club and with the help of some players from outside the parish reached the county final in 1906. After a few years, the club went back to junior and won the county title in 1917. The members of that team were: Paddy Kelly, Frank Donnelly, Paddy Hutchinson, Mick Kavanagh, Michael Finnerty, Jim Power, Michael Broderick, Mick Hutchinson, Mick Kenny, James Dolan, Jack Abberton, Pat Broderick, Mikey Dolan, Jack Kelly, John James Power. After that some of the players moved to Tynagh and helped to form the great Tynagh Team of the 1920s and early 1930s. Jim Power who was the full-back and Mick Kenny who was the Captain were on the Galway team that won the All-Ireland Senior title of 1923. Harold Hodgins who was from Tynagh was full-back on the Galway team that won the National Hurling League in 1932 – he was living in Barnaboy by that time. The club won the East Board Junior Hurling titles of 1936, 1944 and 1947. Those teams were trained by Harold Hodgins and by then the club was known as Abbey Hurling Club. Paddy Conroy of Ballygowan played on the Galway minor team of 1947 and his first cousin, the late Gussie Larkin, was on the minor team of 1953. Frank Flynn from Duniry was full-back on the Galway team that won the National Hurling League in 1951. After 1947 some of the players retired so it was getting harder to field a team and in 1956 Abbey had no team. The championship was on a knock-out basis in those years so it was mostly a case of one day out each year. The club fielded a team again in 1957 and drew with Tiernascragh in the first round but were beaten in the replay. In 1958 the team was beaten in the first round by Loughrea. Later in 1958 Fr Heenan was appointed as curate to Abbey and in 1959 he tried to improve things but numbers were very limited and the junior team was beaten by Closetoken and the juvenile (under 15s) team was beaten by Killimor. In October 1959 the club entered a team in the South Galway 11-aside competition and beat Clarinbridge on a score of 4-3 to 0-1 point. Paddy Fahy who had played at full-back earlier in the year for the under 15 team lined out in goal for the junior team and Ulick Burke who was barely 16 was on the half-forward line. The team was: Paddy Fahy, Tony Hodgins, Naoise Larkin, Vincie McDonagh, Pat Craughwell, John Holohan, Willie Power, Ulick Burke, J J Dolan, Staney Burke, Albie Lawless. In February 1960 they were beaten in the second round by Ardrahan on a score of 7-4 to 5-3. In April 1960 they beat Kiltormer (who won the East Board title in 1959) on a score of 5-5 to 2-2 but because of an objection by Kiltormer the game had to be replayed and Kiltormer won the replay. The team that day was: Paddy Fahy, Tony Hodgins, Algie Abberton, Dessie Lynch, Michael Cummins, Michael Lynch, Pat Craughwell, Willie Power, Tom Fallon, Ulick Burke, John Holohan, Pat McDonagh, Staney Burke, Vincie McDonagh, Albie Lawless. In 1961 Woodford was unable to field a team and three of their players played with Abbey. They were Cathal Stanley, Mickey Kelly and Willie Gorman. They beat Killimordaly in Loughrea and the team was: Pat Craughwell, Mickey Kelly, Algie Abberton, Willie Gorman, Michéal Cummins, Michael Lynch, Tony McNamara, Tom Fallon, Cathal Stanley, John Holohan, Willie Power, Ulick Burke, Staney Burke, Vincie McDonagh, Mattie Donohue. They were beaten by Portumna the following Sunday in Tynagh. In those years Martin Larkin RIP was putting in a great effort with the juveniles and several of these players went on to play junior hurling for the club. In 1962 and 1963 the team was beaten in the first round and in 1964 and 1965 Abbey had no team. 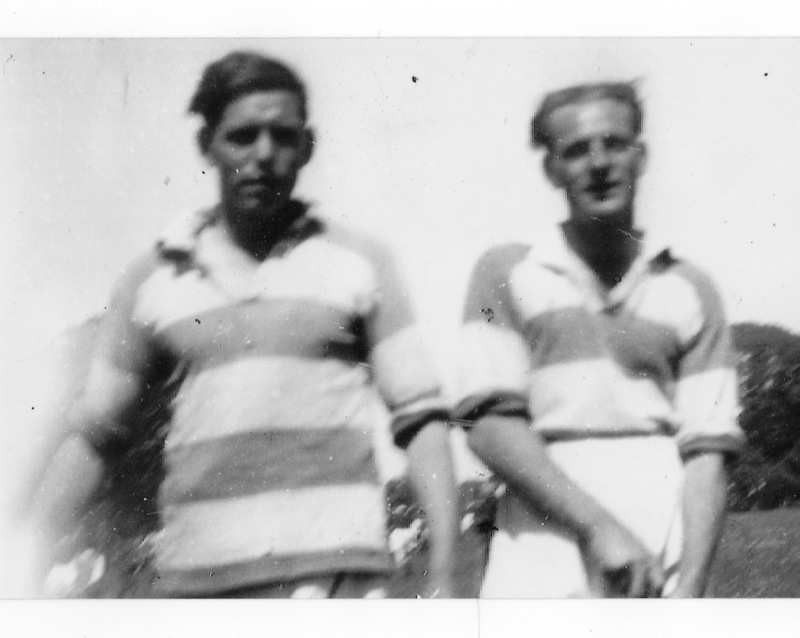 Tom Fallon and Willie Power played with Tynagh and won the East Board Junior Championship in 1964. 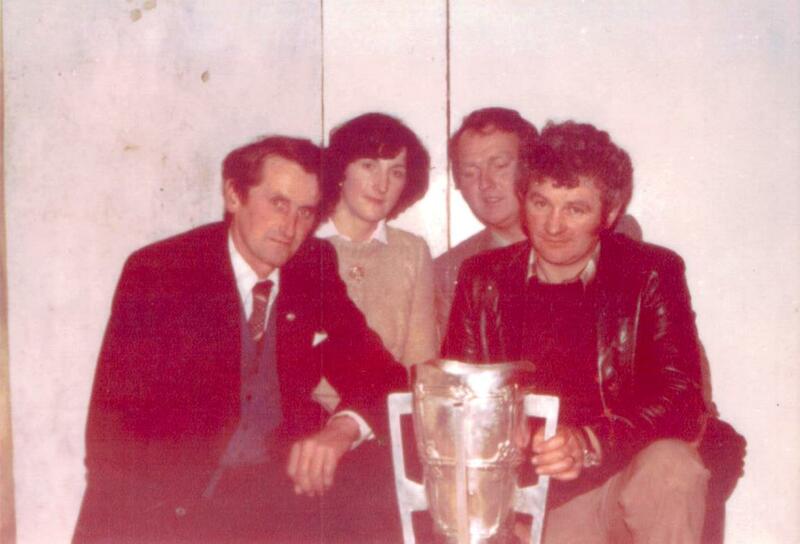 Ulick Burke played with Killeenadeema in those years. In 1966 we formed a football club with Naoise Larkin as chairman, Larry Donnelly, Secretary and Paddy Kelly, Treasurer. Abbey entered a junior and minor team but both were beaten in the first round. In 1967 we had both hurling and football teams and this continued in 1968, 1969, 1970 and 1971. In 1969 the hurling team reached the final of the losers group but were beaten by Kiltormer on a wet and windy day in Ballinasloe. Junior Hurling Final, Abbey v Kiltormer October 1969. 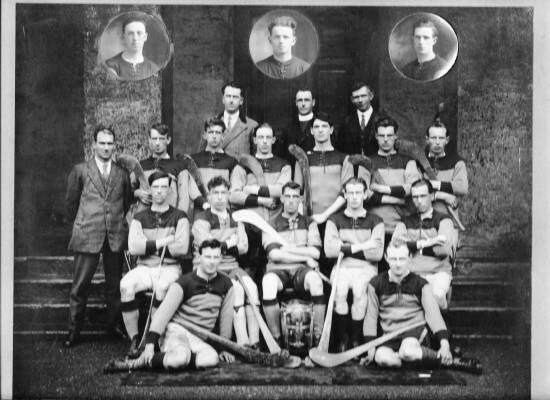 Back row (L to R) Paddy Fahy, John Donnelly, Frank Forde, Tom Pierce, Joe Connors, Joe Hynes, Bertie Cummins, Dan Fallon, Ollie Robinson. Front row (L to R) Sean Crowe, Michael Broderick, Johnny Kelly, Tom Fallon, Pat Craughwell, Jimmy Crowe, Noel Broderick, Martin Ryan, Ulick Burke. Also in 1969 Johnnie Kelly was the goalie for the Galway intermediate team and played a brilliant game against Cork in the Munster Championship – Galway was playing in Munster from 1959 until 1969. Johnnie was working as a forester in the Woodford area in those years and he did excellent work with the under-age teams in 1970, 1971 and 1972. They didn’t win any trophies but quite a few were on the junior team that won the county title in 1986 and some were on the intermediate team that won the title in 1989 and went on to play senior. Johnnie was the goalie for the Galway senior team in 1971, 1972, 1973 and part of 1974. In 1972 Johnnie got married and moved away from the parish but continued to hurl for the club until he retired in 1978. In 1973 Frank Burke came to teach in the parish and he soon took up where Johnnie had left off and had great success with both Abbey and Duniry schools and particularly with the under-14 teams. At this stage the parents and people of the parish were coming out in support and this added new life to the club. In 1979 the under-14 team reached the county final and although they put in a great display they were beaten by Killimor. The team was: John Quirke, Gerard Abberton, Tom Moran, James Shiel, Joe Power, Brendan Kelly, John Dolan, Michael Shiel, John Ryan, John Hodgins, Bernard Sullivan, Raymond Lynch, Martin Ryan, Bosco Curley and Mike Lyons. They drew with Killimordaly in the final of 1981 but were beaten in the replay. They were back again in the final of 1984 but were beaten by Athenry. In 1985 they beat Portumna to win the county final and went on to represent Galway at Féile. Going back to the juniors, they were beaten by Tynagh in the East Board semi-final of 1971 after a great game in Portumna and it was suggested that evening that the two clubs should join to form a senior team. Our team that day was: Larry Donnelly, Noel Broderick, Dan Fallon, John Roche, Mal Donnelly, Ulick Burke, Frank Forde, Johnnie Kelly and Pat Roche, Michael Broderick, Brendan Broderick, Ollie Robinson, Pat Craughwell, Tom Fallon and Paddy Fahy. Tynagh went on to win the East Board and County finals of that year. In 1972 we joined with Tynagh but on condition that the club would still be called Tynagh. This applied to all teams from minor up, but the schools and under-14 team were kept in the parish and were looked after by Johnnie Kelly until he moved from the parish. We stayed with Tynagh through 1972, 1973, 1974, 1975. This was alright for the players who were making the first team but the other players weren’t getting much attention and were losing interest. So in 1976 we formed a club on our own again and it was called Duniry. We went under that name for a few years and we then changed the name to Abbey-Duniry and that name remained until the recent amalgamation with Tynagh. The club is now called Tynagh/Abbey-Duniry. As Abbey-Duniry, we had a lot more success – not because of what name the club was called but because there were a lot of young players coming through – thanks to Johnnie Kelly and Frank Burke. In 1984 the juniors won the Centenary cup. It was the first trophy won by an adult team from the club since 1947 and it was the start of what turned out to be the best spell in the history of the club. 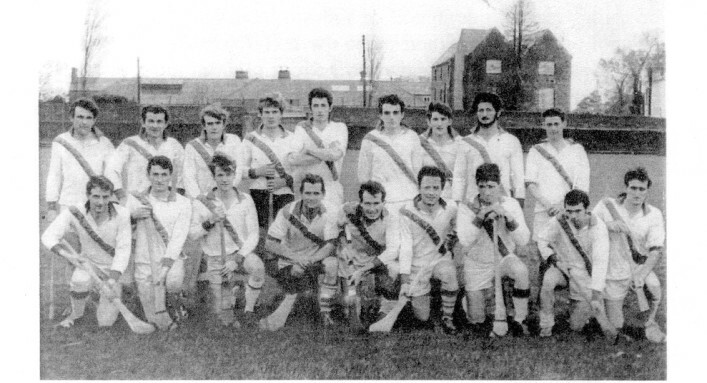 The 1984 team was: Ignus Dolan, Aidan Donnelly, Francis Hynes, Joe Keane, Sean Flynn, Mike Conroy, Brendan Kelly, Mattie Kenny, John Ryan, Gerry Larkin, John McHugo, Michael Shiel, P J Kenny, Frank Conroy, Michael Murphy. In 1985 Pat Robinson from Tynagh was appointed trainer with Pat Clarke and the late P J Madden as his selectors. They got to the county junior final of that year and won it the following year. They did well in the intermediate grade in 1987 and 1988 and drew with Portumna in the final of 1989 – thanks to a last second goal by Gerry (Rocky) Madden from a half chance. They won the replay after a wonderful display. Paddy O’Meara from Lorrha was now the trainer and he did an excellent job. Kevin Devine was the goalie and he went on to play for the Galway minors, under 21s and seniors and he is still playing in goal for the club’s senior team after 22 years. Bertie Roche was the chairman and made a huge contribution to the club. Others who did great work for the club down the years were: Larry Donnelly, Ollie Robinson, Ollie Fahy, Seamus Killeen RIP and P J Madden RIP. In 1990 we had a senior team again after all those years and it was very pleasing for everyone who struggled to keep the club going in the 50s, 60s and 70s. In the early years it was hard to adjust to the level of senior hurling and in 1992 James Shiel returned from the USA and played a big part in helping the club to avoid relegation. In 1995 the club reached the county semi-final but were beaten by Portumna. The team had different trainers in those years but it was when Mattie Kenny took over as manager with Gerry Larkin, Frank Conroy and Eugene Madden as his fellow selectors and Mattie Murphy as trainer that the team got into top gear. They drew with Athenry in the county final of 1998 and were in very hard luck to be beaten in the replay. In 1999 they were again unlucky to be beaten by Athenry in the county final. But it was in 2000 that the team was in the toughest luck of all – they were leading Athenry by a point with time up but the referee decided to play an unreasonable amount of extra time and gave Athenry the chance to come back and score two points and win the game. If ever a team deserved to win a county final it was that Abbey-Duniry team. They deserve a special place in the history of the club. The sad part about it was that Athenry were winning all-Ireland titles far easier than they were beating Abbey-Duniry in those years. All the players and substitutes on that team together with the selectors came through from the under-age teams coached by Johnnie Kelly, Frank Burke, Michael Broderick, Joe Egan, the late Amby Hodgins and Fr T J O’Connell who came as a curate to Abbey in 1990. In 2001 Liam Hodgins and Kevin Broderick starred for the Galway senior team against Kilkenny in the semi-final and against Tipperary in the final and both were selected on the all-stars team of that year. We were the only club in the country to have two all-stars in 2001. The club had come a long way from the time we were getting it hard to field a junior team. Switching back to the underage teams, Michael Shiel and John Ryan, both of whom had played at centerfield on the 1979 under-14 team were members of the 1983 Galway minor team that brought the all-Ireland title to Galway for the first time. And the following Sunday Mattie Kenny was a member of the Galway under-21 team that won the all-Ireland title. Liam Hodgins and Kevin Broderick were members of the Galway minor team that won the all-Ireland title in 1994 and the under-21 title in 1996. Mick Kenny and Jim Power were the only players form the parish to win all-Ireland senior medals but several others played senior hurling for the county including Willie Donnelly from Kylemore who played for both Galway and Cork, Frank Flynn, Michael Lynch, Johnnie Kelly, Kevin Broderick, Liam Hodgins, Mattie Kenny, Kevin Devine, Thomas Kavanagh, and Fergus Flynn who was from Clare. I hope this brings back many memories to those of you who read this. No doubt there are lots of bits left out here and there so please feel free to use the comment box if you wish to add anything further. This page was added on 10/09/2014.